According to All-America Rose Selections' website, you don't need to have gardening skills to grow roses. All you need is the right rose for your region, six hours of sunlight each day and regular watering. All plants, however, require plant food for nourishment during the growing season. Miracle-Gro offers a variety of products to help nourish your roses. Horace Hagedorn and Otto Stern introduced Miracle-Gro in 1951. By 1995, the company was the leading brand in gardening. It produced a line of fertilizers and tools to help make the application of fertilizer easier for the gardener. In 1995, the company merged with Scott. The name was changed to Scott's Miracle-Gro. The company continues to expand with new products. It netted 3.1 billion dollars in sales for 2009. Scott's has products for all your garden needs including potted plants and in-ground plants. The company sells plant food, soils, organic products, hose feeders and garden weed-control products. Scott’s Miracle-Gro products specifically for roses are created for outdoor plants and include a garden soil, a continuous-release rose plant food and a water-soluble plant food. Scott's also offers the Nature Scapes line of mulches as well as the Orthro products for bug control. Nature Scapes and Orthro can be used for roses. Roses need a generous amount of plant food. 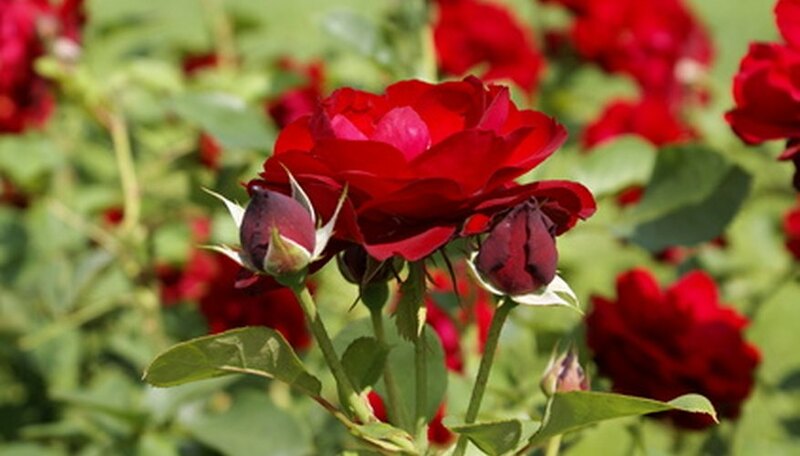 Scott's Miracle-Gro offers a water-soluble plant food specific to roses. It comes in a 1.5 or 5 lb. box. Use 1 tbsp. in a gallon of water. Thoroughly soak the soil with the solution using 1 gallon for each rose bush. You should water beyond the rose bush, so the wide-spreading roots are saturated. Feed the plant every 7 to 14 days during the growing season. To protect your roses from fungal diseases such as black spot, mildew and rust, choose plant-resistance varieties. It is also important to have well-drained soil with a pH between 5.8 and 6.2, according to the Scott's Miracle-Gro website. Because overfeeding and underfeeding roses can make the plant more susceptible to disease, Scott's offers its Miracle-Gro Shake 'N Feed continuous-release plant food. It lasts for three months and takes the guesswork out of how much plant food is needed. The continuous-release plant food is also available in Miracle-Gro soil for roses. Use when first planting your rose bushes. Scott's Miracle-Gro products are available in most big lot stores as well as your local garden centers. Garden centers may have a larger selection of products.